The moon landings were not a hoax. My second piece of proof is the Lunar Laser Ranging Experiment deposited by Apollo 11 which is routinely used to this day to find the distance of the moon. No lunar rover has ever been created that could carry something like that and place it in the correct place. I would appreciate it if con could give me a plausible explanation for these inconsistencies in the Lunar Landing Hoax "theory." The lunar landing conspiracy theories date back to the day after the moon landing, when man stopped, looked up at the sky, and said, "Aw, hell no! We couldn't have possibly landed on the Moon. That's, like, a gajillion miles away." I am here to show why these people think that. Keep in mind that I'm not actually a Moon Landing Conspiracy Theorist. "hundreds of people were on sight watching the Apollo launchs"
Only the really, really crazy Theories say the launch never happened. This debate is about landing on the moon, not shooting a giant missile into space. Hell, even the North Koreans can do that. Correction: The government claims to have spent 24 billion. These figures were released by the government, approved by the government, and controlled by the government. If they faked a moon landing, they could easily add a couple dollars that don't exist. "if NASA wasn't working on the Apollo moon landings for 10 years then what were so many of the scientists and engineers working on?" Moon landings were far from NASA's only project in the 60s. Even the most levelheaded of Americans won't dispute the fact that the Moon landings were merely a PR-friendly face for the Cold War era space race. There are several explanations for what NASA was doing during the Space Race. 4. They were actually trying to get to the moon, but came up behind schedule and ended up faking the trip. 5. There never was a Space Program, or even a Cold War, and all that was just thought up by the US and the USSR to give them more leverage in global politics. 8. It was a money laundering scheme. There never was a Space Ship, just a giant rocket they shot off into the air to impress the Soviets. The government was so embarrassed, they covered it up with a sh*tty movie they pieced together from some astronaut costumes and washed-out footage of New Mexico. "Also the government must have given a pretty big bribe or threat to keep the 400000 workers and 20000 industrial firms and universities from saying a single word about it being faked"
Where did you get those figures? Wikipedia. Where did Wikipedia get them? The goddamned NASA website. Actually, I'm gonna stick with #8 of the "Things NASA was doing in the 60s" list. It sorta makes sense, now that I think about it. You can try to refute that. You will fail. Mwahahaha! There is one big problem with all of these arguments; every last one relies on the assumption that the government falsified records which cannot be proved. As there is no way to prove this nor any evidence to support the accusation of trickery; these arguments are unwarranted and should be dismissed. You are quite right to say that Moon Landing theories rely on the assumption that he government falsified documents. However, that doesn't automatically mean they're unwarranted. The government had several possible motives for falsifying documents, not the smallest of which was to "beat" the Soviet Union, demoralizing them and getting the US a leg ahead in the Cold War. The fact of the matter is that the Government will always try to save money, and it's a hell of a lot cheaper to doctor some photographs and make a video of a moon landing than to actually build a multi-million dollar, astronaut-sustaining, shuttle holding, laser placing rocket. Placing a man on the moon has no advantage other than that of ethics, and this was the MOTHERF*CKING COLD WAR! There were no ethics! You also say that there is no evidence to support accusations of trickery. To the contrary, there is lots of evidence. I just haven't shown it to you, yet. Let us embark on a journey through space, to try and find holes in NASA's story. It's photo-breakdown time! 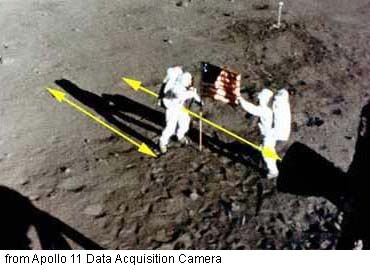 In the picture released by NASA following the Apollo 11 launch, you can clearly see an astronaut saluting an American flag, which appears to be fluttering in the breeze. Unfortunately for the Government, there is no flag-fluttering breeze on the moon. There is, in fact, no atmosphere. The photo must have been fabricated. As you probably know, the sun is very, very far away from the moon. So far, that two objects of approximately equal height, about a foot apart from each other, should have shadows of approximately equal length. So check out this photo. Look at that picture. Look at it. Now look at this one. The difference between the rocks is fairly obvious. Do you see the C? Movie props are numbered or lettered, to show stagehands where they go. The rock is a stage prop. They don't need props on the moon, they have real rocks. There you go, Pro (Hah! If NASA had GoPros in 1969, they might have gotten away with it!). Pictures. Pictures that were doctored, pictures that aren't all they seem to be. Is that evidence-y enough for you? Also, I didn't know this debate was only three rounds. If pro would agree to continue this debate at a later date, I'd be happy to accept. In the mean time, just vote on whoever had better arguments (hint: It's me!). Peace.